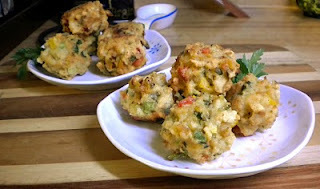 One of my favorite meals my father and I use to make together was Conch Fritters! Conch in general has always been my favorite seafood. Sometime in the early nineties it was found the conch population in U.S. waters were disappearing and fishing of conch was severely limited. Now days if you want conch you can either empty your wallet or take a trip down to one of the islands in the Caribbean. On the Pacific coast there is another type of sea snail called Abalone. The flavor is comparable but its own. Despite this I decided to make my favorite Fritter recipe (which is also good for conch, clams, shrimp or crab) with Abalone. Zo told me that she really thought they were great tasting and is excited about trying conch fritters when we are in the islands! I really hope you enjoy this tasty recipe from my childhood! Mix together all ingredients, cover and refrigerate until ready to use. In a large mixing bowl mix Abalone together with vegetables, cilantro and garlic until even. By hand fold in eggs and cream until mixed well. By hand fold in flour, seasonings, cornmeal and cornstarch until evenly mixed. Cover and refrigerate batter for 45 minutes to an hour. Heat oil over medium high heat. Once heated drop 1-2 tbsp balls of batter into oil and cook till golden (1-3 minutes.) As fritters finish cooking scoop out with a slotted scoop and place on a paper towel covered plate to drip away excess oil. Serve hot with dipping sauce and enjoy!